For most people vision comes naturally. The seemless ease of the process disguises a complex web of interactions amongst vast networks of visual neurons. The complexity and fragility of these networks are revealed most vividly for those people afflicted with ocular diseases like glaucoma. The objectives of our research lab is: i) to understand how neural networks of the eye represent visual images in the optic nerve signals that it sends to the brain under normal and diseased conditions and ii) to use the knowledge to engineer ocular devices and effective diagnostic and therapeutic strategies. b) Light enters the eye through an array of approximately 1000 ommatidial lenses. Within each ommatidium 10-12 retinula cells transduce the visual input into an electrical signal that passively propagates to a single eccentric cell. The eccentric cell encodes the electrical signal with action potentials that are sent down the optic nerve to the brain and sent laterally to neighboring ommatidial receptors to inhibit their activity. c) An electrical equivalent circuit of the neural mechanisms for vision in the crab eye. The model can accurately reproduce the output of the eye under daytime lighting conditions. d) Response of single nerve fibers are recorded with a microelectrode (#) of crabs moving in the ocean while the input to their eye is monitored with an underwater video camera (*). e) Crabcam image of a black underwater target about the size of a female horseshoe crab (left). Males can see such a target almost equally well day and night. The target is detectable is the output of a nighttime model of the crab eye if a nonlinear mechanism known to activate at low levels is included in the model (right) and not when the mechanism is excluded (middle). 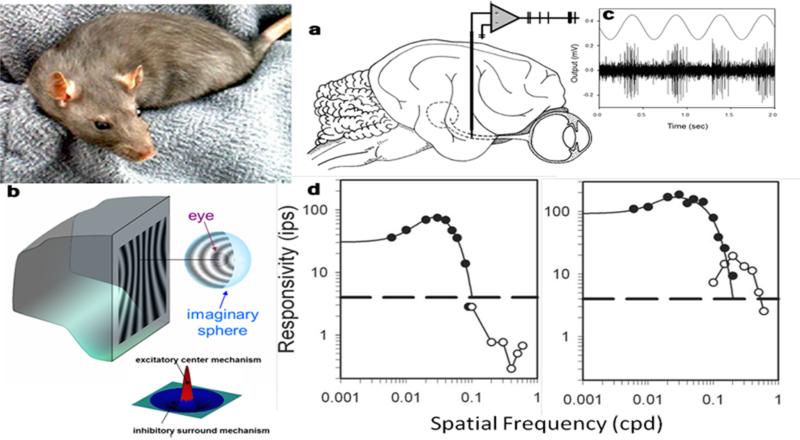 a) Sensitivity of the horseshoe crab eye to light is modulated by a circadian clock in the animal’s brain, as evidence by the daily rhythm in ERG amplitude (peak-to-peak) that is measured from the eye of animals kept in constant darkness. b) Efferent optic nerve fibers of the circadian clock can be recorded or stimulated by opening a small hole in the carapace and inserting portions of the nerve in a suction microelectrode. c) Clock fibers are active only at night and their activity is complex in structure, with spike fired in multicellular synchronized bursts (top) that repeat in regular intervals of 1-2s (middle) that are clustered together in periodic episodes of activity separated by minutes of silence (bottom). d) Circadian messages are encoded in the burst activity, as stimulating the optic nerve electrically with artificial spike trains (blue intervals) causes ERG amplitude to increase to a sustained level which returns to baseline when stimulation ceases. b) Visual stimuli are presented to the animal on a video monitor. Due to the poor resolution of the rat eye, the stimuli are optically transformed to correct for planar distortions at close viewing distances. c) Retinal ganglion cells respond to drifting sinewave gratings with a sinusoidal modulation of spike rate. d) By varying the spatial frequency of drifting (filled symbols) and contrast-reversing (unfilled symbols) gratings, the spatial transfer function of ganglion cells is mapped. 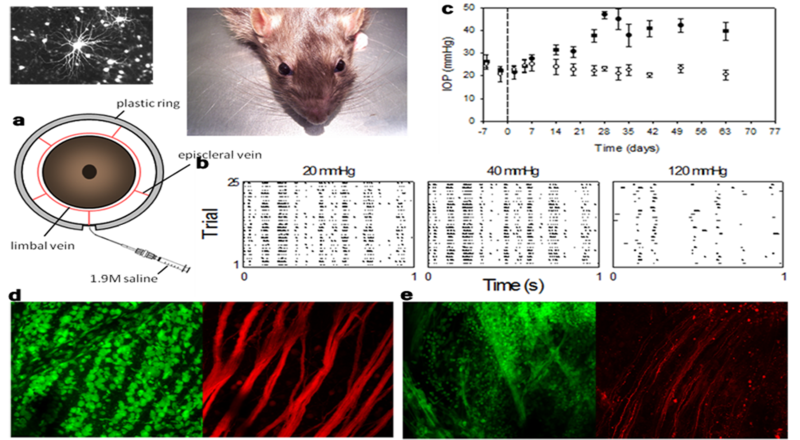 X and Y types of ganglion cell may be identified in rats, with both having a maximal resolution of 0.1-0.3 cycles/degree. Like other mammals, Y cells (right) are generally more responsive than X cells (left), and they generate frequency-doubled responses to reversing gratings centered on the receptive field that are significantly greater than the baseline noise level (dashed line). a) Morrison method of glaucoma induction in rats. Hypertonic saline is injected into one episcleral vein while other veins are temporarily occluded with a plastic ring, which scleroses the limbal vasculature. b) After a period of a few weeks intraocular pressure (IOP) is significantly elevated in the treated eye (filled symbols) relative to the untreated eye (unfilled symbols). c) Ganglion cell responses are tolerant to acute increases from the resting IOP level (20mmHg plot) to a glaucomatous IOP level (40mmHg plot) and deteriorates only when IOP nears blood perfusion pressure (120mmHg plot). An outstanding research question is why chronic pressure increases like in b, which have no short-term effects, cause ganglion cells to die. d) Images of the ganglion cell layer of the untreated (control) eye of the rat in b. Green: Nissl stained somata of displaced amacrine and ganglion cells. Red: Rhodamine dextran backlabeled ganglion cell axons and cell bodies. e) Images of the ganglion cell layer of the treated eye of the rat in b. Green: Nissl stained somata of displaced amacrine and ganglion cells. Red: Rhodamine dextran backlabeled ganglion cell axons and cell bodies. Whole-cell recordings of light-evoked excitatory synaptic currents in the retinal slice. J Vis Exp 17, pii:771, doi:10.3791/771. Using the horseshoe crab, Limulus polyphemus, in vision research. J Vis Exp 29, pii: 1384. doi: 10.3791/1384. 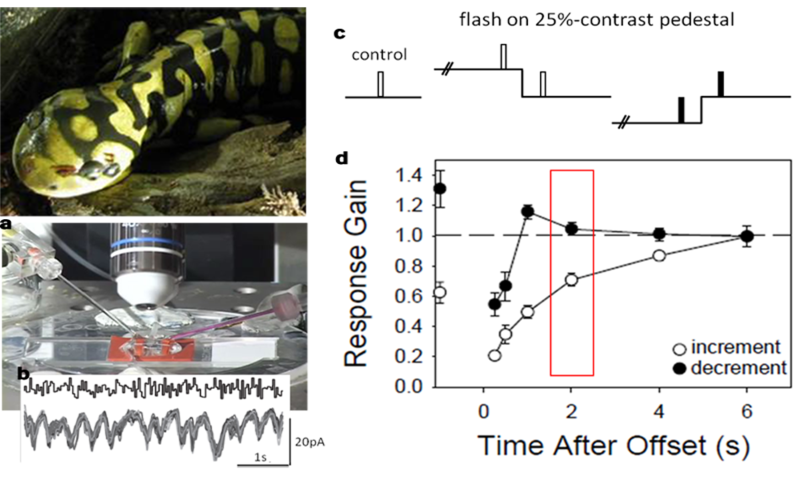 Bello SA, Passaglia CL (2017) A Wireless Pressure Sensor for Continuous Monitoring of Intraocular Pressure in Conscious Animals. Annals of Biomedical Engineering 45(11):2592-2604. Bello SA, Malavade S, Passaglia CL (2017) Development of a Smart Pump for Monitoring and Controlling Intraocular Pressure. Annals of Biomedical Engineering 45:990-1002. Ortiz G, Odom JV, Passaglia CL, Tzekov RT (2016) Efferent influences on the bioelectrical activity of the retina in primates. Doc Ophthalmol DOI 10.1007/s10633-016-9567-5. Tang X, Tzekov R, Passaglia CL (2016) Retinal cross-talk in the mammalian visual system. J Neurophysiol 115:3018-3029. Valtcheva TM, Passaglia CL (2015) Contrast adaptation in the Limulus lateral eye. J Neurophysiol 114:3234-3241. Passaglia CL, Herzog ED (2014) Circadian Modulation of the Limulus Eye for Day and Night Vision. The Retina and Circadian Rhythms Chapter 10. Wellman A, Edwards BA, Sands SA, Owens RL, Nemati S, Butler J, Passaglia CL, Jackson AC, Malhotra A, White DP (2013) A simplified method for determining phenotypic traits in patients with obstructive sleep apnea. J Appl Physiol 114:911-922. Troy JB, Yrazu FM, Passaglia CL (2012) The Uniqueness of the Message in a Retinal Ganglion Cell Spike Train and its Implication for Retinal Prostheses. IEEE EMBS 34:312-313. Heine WF, Passaglia CL (2011) Spatial receptive field properties of rat retinal ganglion cells. Vis Neurosci 28:403-17. 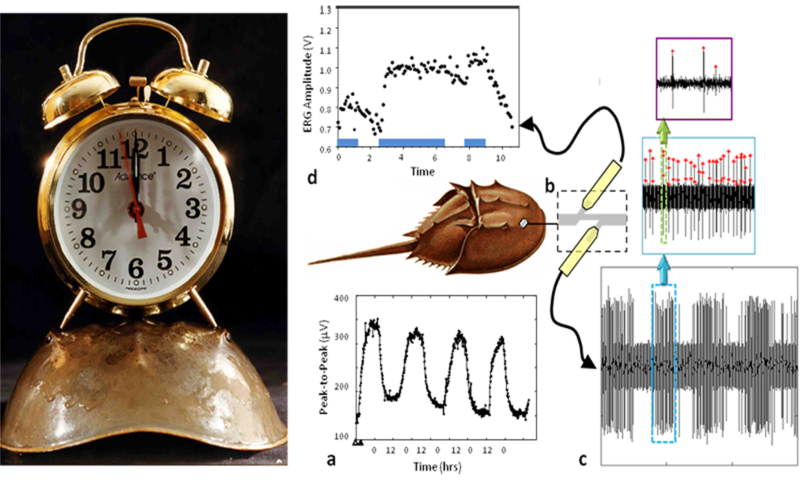 Liu JS, Passaglia CL (2011) Spike firing patterns of circadian clock neurons in Limulus. J Biol Rhythm 26:335-44. Wellman A, Eckart DJ, Jordan AS, Edwards BA, Passaglia CL, Jackson AC, Gautam S, Owens RL, Malhotra A, White DP (2011) A method for measuring and modeling the physiological traits causing obstructive sleep apnea. J Appl Physiol 110: 1627-37. Freeman DK, Grana G, Passaglia CL (2010) Retinal ganglion cell adaptation to small luminance fluctuations. J Neurophysiol 104: 704-712. Freeman DK, Heine WF, Passaglia CL (2010) Singel unit in vivo recordings from the optic chiasm of rat. J Vis Exp 38, pii: 1887. doi: 10.3791/1887. 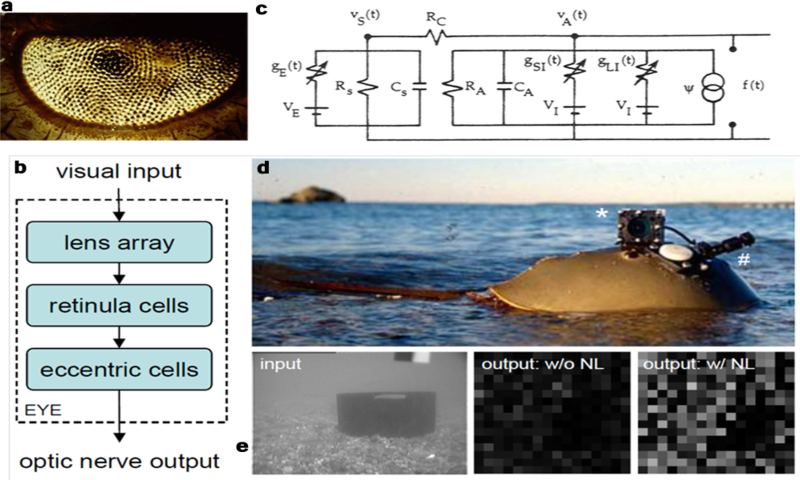 Liu JS, Passaglia CL (2009) Using the horseshoe crab, Limulus polyphemus, in vision research. J Vis Exp 29, pii: 1384. doi: 10.3791/1384. Passaglia CL, Freeman DK, Troy JB (2009) Effects of remote stimulation on the modulated activity of cat retinal ganglion cells. J Neurosci 29:2467-76. Werner B, Cook PB, Passaglia CL (2008) Complex response patterns from a simple retinal circuit. J Neurophysiol 100:1087-97. Freeman DK, Heine WF, Passaglia CL (2008) The maintained discharge of rat retinal ganglion cells. Vis Neurosci 18:1-10. Werner B, Cook PB, Passaglia CL (2008) Whole-cell recordings of light-evoked excitatory synaptic currents in the retinal slice. J Vis Exp 17, pii:771, doi:10.3791/771. Troy JB, Bohnsack DL, Chen J, Guo X, Passaglia CL (2005) Spatiotemporal integration of light by the cat X-cell center under photopic and scotopic conditions. Vis Neurosci 22:493-500. Passaglia CL, Troy JB (2004) Impact of noise on retinal coding of visual signals. J Neurophysiol 92:1023-33. Passaglia CL, Troy JB (2004) Information transmission rates of cat retinal ganglion cells. J Neurophysiol 91:1217-29. Passaglia CL, Guo X, Chen J, Troy JB (2004) Tono-Pen XL calibration curves for cat, cow, and sheep. Vet Ophthalmol 7:261-4. Passaglia CL, Troy JB, Rüttiger L, Lee BB (2002) Orientation sensitivity of ganglion cells in primate retina. Vision Res 42:683-94. Passaglia CL, Enroth-Cugell C, Troy JB (2001) Effects of remote stimulation on the mean firing rate of cat retinal ganglion cells. J Neurosci 21:5794-803. Passaglia CL, Dodge FA, Barlow RB (1998) Cell-based model of the Limulus lateral eye. J Neurophysiol 80:1800-15. Passaglia CL, Dodge FA, Herzog EH, Jackson BS, Barlow RB (1997) Deciphering a neural code for vision. Proc Nat Acad Sci 94:12649-54. Passaglia CL, McSweeney M, Stewart K, Kim E, Mole E, Powers M, Barlow RB (1997) Visual performance of horseshoe crabs: role of underwater lighting. Biol Bulletin 193:205-7. Stewart K, Porcello D, McSweeney M, Saito T, Passaglia CL, Dodge FA, Barlow RB (1997) Histamine: putative transmitter for lateral inhibition in the Limulus eye. Biol Bulletin 193:203-7. Kim E, Passaglia CL, Dodge FA, Barlow RB (1996) The temporal transfer function of the Limulus lateral eye in situ. Biol Bulletin 191:259-60. Passaglia CL, Dodge FA, Barlow RB (1995) Limulus is tuned into its visual environment. Biol Bulletin 189:213-5. Passaglia CL, Dodge FA, Barlow RB (1994) Visual responses from the brain of Limulus. Biol Bulletin 187:260-1. Herzog ED, Passaglia CL, Dodge SA, Levine ND, Barlow RB (1993) Limulus vision in the ocean: comparing neural and behavioral thresholds. Biol Bulletin 185:307-8. Sophomore-Level course on how to formulate mathematical models of dynamic systems through application of theoretical principles and experimental observations and how to simulate the behavior of model systems through application of analytical and numerical methods of differential equation solution. Major concepts include first- and second-order linear constant-coefficient ODEs with applications to biological, chemical, electrical, and mechanical systems, Laplace Transforms and system transfer functions, and basic numerical techniques and software for system simulation. Junior-Level course on developing necessary mathematical and computer programming skills for solving engineering problems, particularly those involving chemical systems and biomedical processes. Major concepts include computer arithmetic and approximation errors, numerical differentiation and integration, interpolation, regression, and methods for solving systems of linear and nonlinear equations and of ordinary and partial differential equations. Junior-level course in applying signals and systems analysis techniques to biomedical problems. Topics include: Fourier series, Fourier integral, Laplace transforms, convolution, impulse and frequency responses, sampling theory, and Bode diagrams, as well as an introduction to communication systems, multiplexing, and amplitude/frequency modulation. Graduate-level course in human physiology for biomedical engineering students. Fundamentals of cellular and systems physiology, including the nervous, muscular, cardiovascular, respiratory, renal, gastrointestinal, endocrine, and immune systems. Quantitative and engineering approaches are applied to physiological concepts. Graduate-level course in building mathematical models of biological systems from input-output data. Topics include: input signals for system identification, data transformation and reduction (PCA, ICA), nonparametric (impulse/freq response, Volterra/Weiner kernels, block structures) and parametric models (ARMA, Box-Jenkins, NARMAX) of linear and nonlinear systems, parameter estimation and numerical methods, recursive identification (adaptive models, state space/Kalman filtering), system identifiability and parameter sensitivity, model selection/validation, optimal experiment design. Applications mainly to systems biology and physiological systems (eg., visual, auditory, neuromuscular).